It's another dual duty post today! I'm doubling up again on the #31DC2015 and #StampingSaturday. Today's prompt was Stripes. 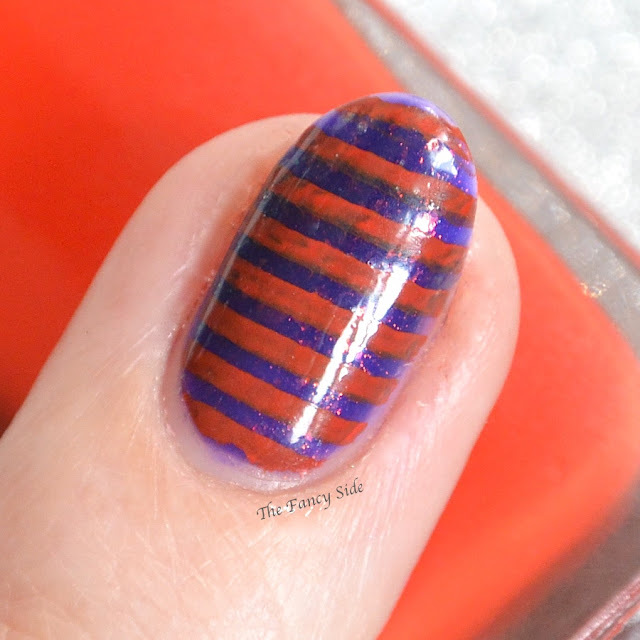 I thought stripes should be easy enough. I had good intentions, but I'm not sure I like where I ended up here. Meh...you tell me what you think. I started off with a base of Dance Legend No.529 Deco Dance. This was an exclusive to Llarowe's shop. It's a royal purple jelly base filled with rainbow flakies. 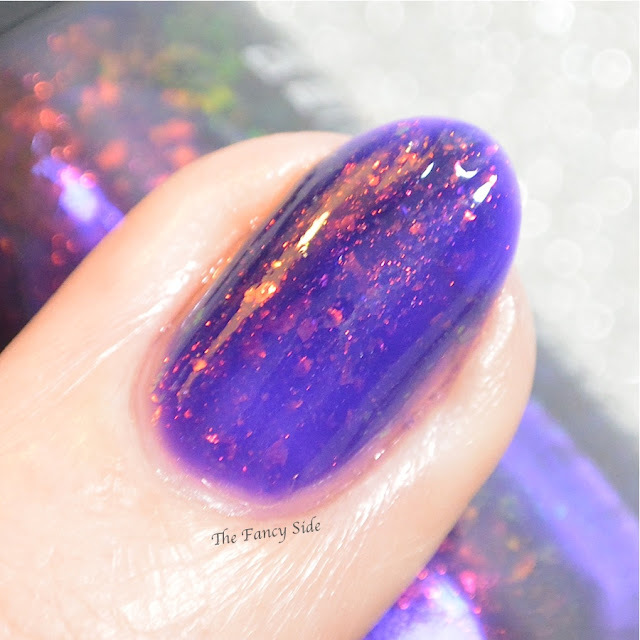 The flakies look way cooler in the bottle than they do on my nails. I hate when that happens. 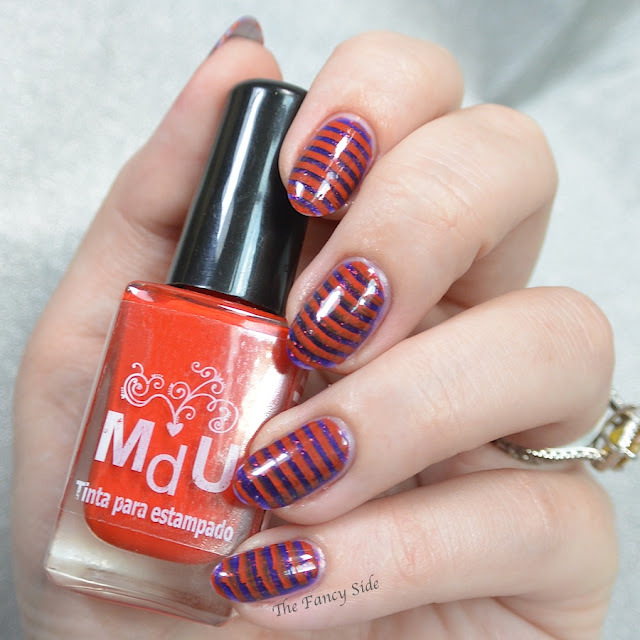 I then stamped on some stripes in Mundo de Unas Reddish with MoYou London Pro Collection 1. I was trying to play off the red in the flakies but it didn't work out quite like I'd imagined. Instead of a cool effect I ended up with witches socks. There you have it! #StampingSaturday and #31DC2015 stripes. Tomorrow is animal print and I really love my idea. I hope it works like I want it too! Oh the purple is lovely!! And I did get the witches socks thought before I read your comment, hehe. 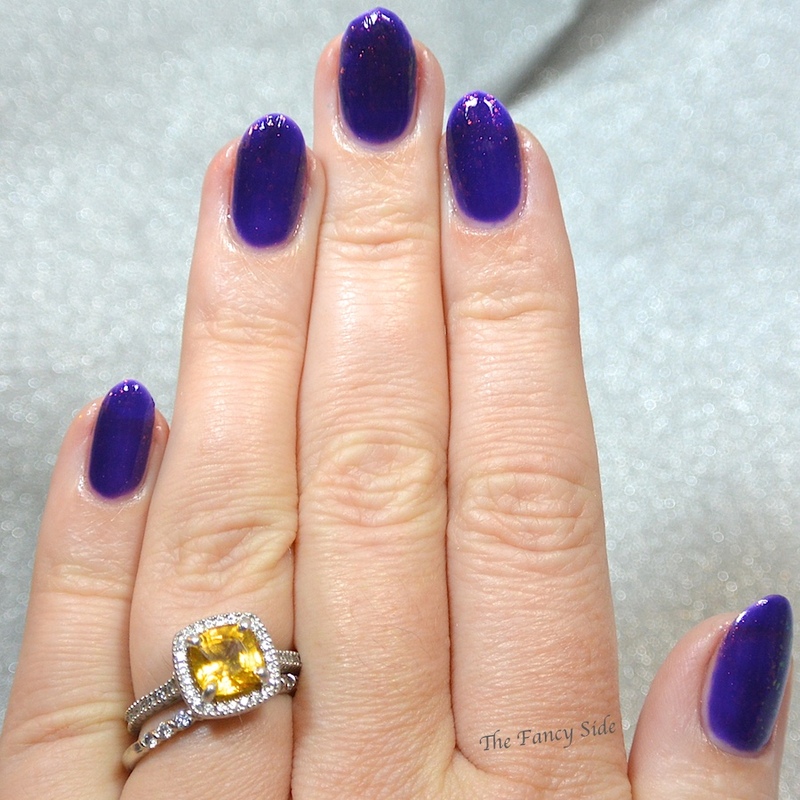 That purple polish is gorgeous! I may have laughed a little too hard at your witches socks reference! LOL. I think it's great. It reminds me of a witches tights! Unintentional win with the witches socks. Lol! You chuckled because you know it's true. LOL at witch's socks! That purple is lovely! They would be so cute as little girl tights! Gorgeous color, and I love it with the Orange!!! That dance legend though! Gah! Its so pretty. I couldn't do it justice with pictures. Dance Legend always has amazing stuff! Awesome mani! I do love the few I have. Dance Legend has beautiful shades! Love this mani! Beautiful color! I've never tried this brand. They are fun but hard to find. They still look really cool and fall-like, even if they didn't quite work out how you had been hoping. 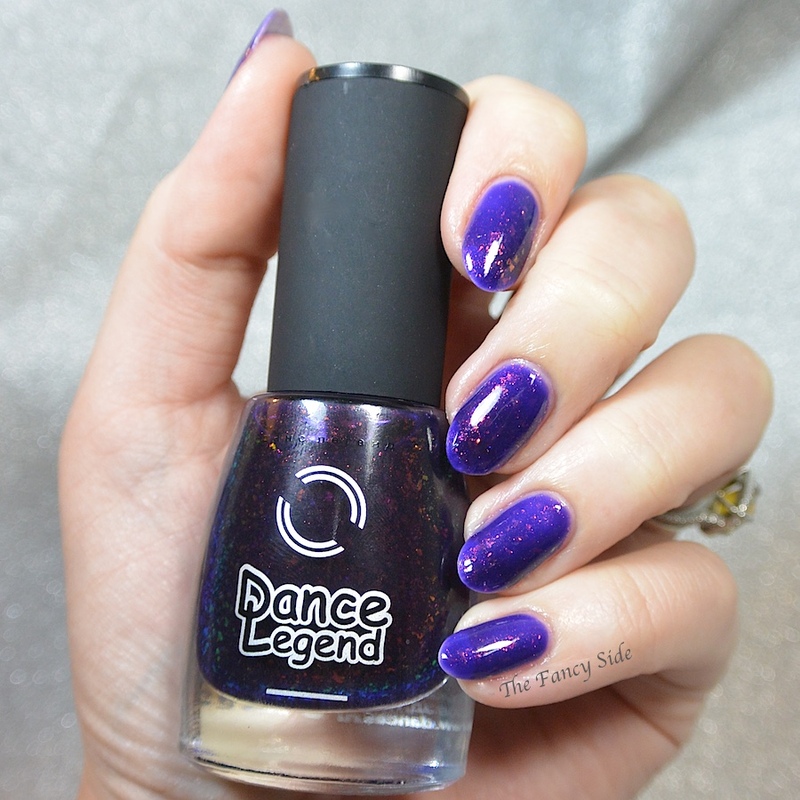 Dance Legend makes some pretty incredible polishes. 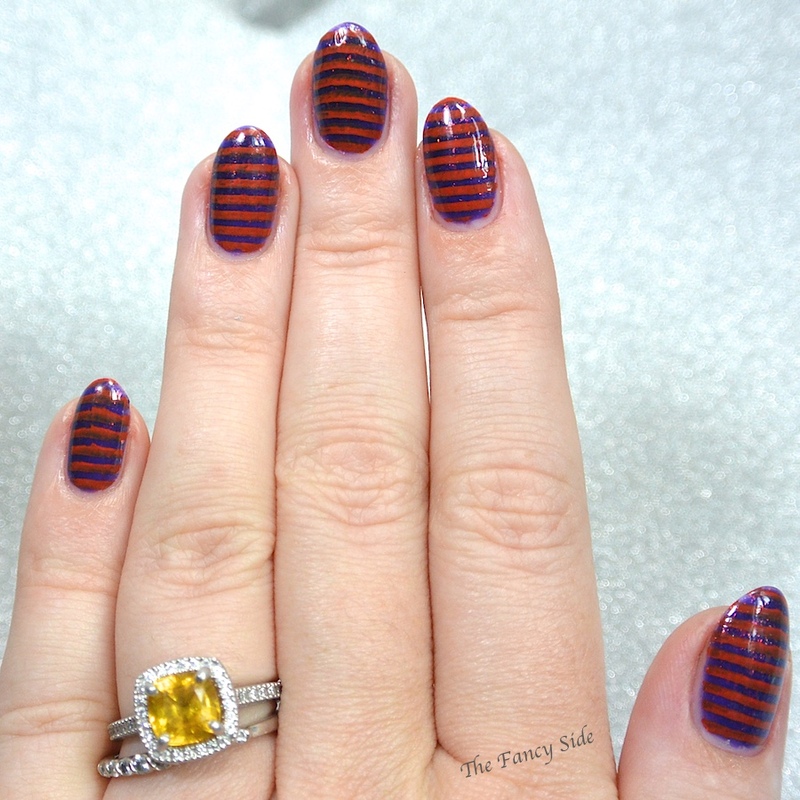 I really like the striped look, even if it wasn't what you planned! Thank you! DL polishes are so fun, I wish they weren't hard to find though.